To have main keywords in the URL is always preferred and recommended SEO technique. In the following URL rewrite you can display the name of the product in URL. Note that id and keywords (s) are passed as GET vars. I want that if you type inimist.com in browser you should be redirected to www.inimist.com. If you want to do same with your website then put the following code to .htaccess file. To know more on benefit of this kind of redirection please check the post about SEO friendly redirect (301) redirect in php and .htaccess. Most of the user based social networking websites like to show user profiles this way. For example my profile at facebook is at https://www.facebook.com/arvindkthakur.jnr. How do they do it. 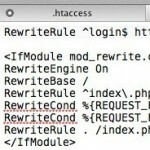 To have a same kind of redirection i.e http://yoursite.com/abc to http://yoursite.com/user.php?username=abc you can add the following code to the .htaccess file. 5) Redirecting the domain to a subfolder of inside public_html. Suppose that you are redeveloping your website and all the development is being performed inside the “dev” folder which is placed at root. So, in this case development version of the website can be accessed like “inimist.com/dev”. Now you want to show the development website when accessed at http://www.inimist.com. To achieve you just need to place the following code inside the .htaccess file in the root folder of the website. Placing it, www.inimist.com should point to the files inside “dev” folder.